OFFENSE: In this space last week, we said that the Cardinals were going to face the toughest defense they have all year in Pickerington Central. That ended up being true as they held the Cards to 28 points and constantly shut down big plays. The Tigers’ speed and athleticism, combined with experience defending the option on multiple occasions this season, made this a difficult matchup for Colerain. Their opponent this week, St. Edward, has neither the overall speed & athleticism or experience defending the option the way Central did. Now, that is not to say the Eagles are not a good defense…they most definitely are. The Eagles allow just 317 total yards per game and 20 points against one of the toughest schedules in the state. The Cardinals will be able to run the ball and may even toss the pigskin around a little. But just like last week, they must AVOID TURNOVERS. The Eagles have a ridiculous 12 turnovers (8 FR, 4 INT) in the playoffs. Like a GCL team, they hit hard and look to dislodge the football. If the Cards can avoid that and continue to build the offense around Ivan Pace Jr. up the middle and JJ Davis on the edge, DSM will find opportunities to keep the ball as well. DEFENSE: The Cardinal defense came through again last weekend, holding Pickerington Central to 14 points. The Cardinals built a 14-0 lead at halftime and never trailed in a State Semi-Final game. That is impressive. The only time the Tigers got anything moving was in the 3rd quarter when LB Ivan Pace Jr. had to leave with a dinged up ankle. They tackled well and even sacked star Central QB Demeatric Crenshaw three times. This week, it is the two-headed monster of Sr. QB #6 Garrett Dzuro (Sr.) 6’0” 200 lbs and Sr. RB #3 Jordan Castleberry (Sr.) 5’7” 195 lbs. Both players have rushed for over 1,000 yards this year and as a team, they average just under 385 yards and 33 points per game. Dzuro is a seasoned vet who has accounted for over 2,800 combined yards and 31 TD’s. He is shifty and operates out of a read-option offense. RB Castleberry is the main threat out of the backfield. With over 1,400 yards rushing and 18 TDs in the regular season, he is quick and has excellent burst. While not a threat to catch the ball out of the backfield a lot, he can take screen and seam passes the distance. The defense must stay aggressive, but not TOO aggressive to create running lanes for Dzuro who will take off and keep the chains moving. This is a very good offense that the Cardinals are going to have to work hard to contain. Bottom-Line: 14 years. 178 games later…the Cardinals are back in the State Championship. So many near misses since 2004 led even the most ardent supporters to wonder if we’d ever get that needed combination of talent, execution and luck to make it back. Well, that question has been answered! 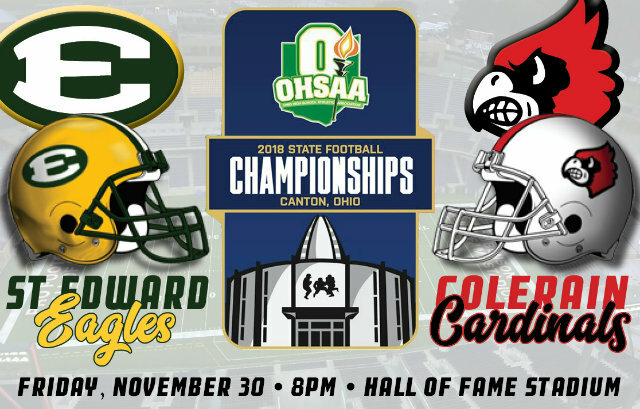 And what awaits Colerain is arguably the team of the decade in the St. Edward Eagles. This is their 7th State Championship game appearance. They hold a 3-3 overall record, having won their last 3 trips in a row (2010, 2014, & 2015) beating Huber Heights Wayne each time. Ironically, their three losses came to three Cincinnati teams: Moeller, Fairfield & Elder. Could this be the 4th loss in a State Title game to a team from Cincinnati? Yes…yes it could. As long as Colerain leans on their seniors and teamwork the way they have all year, the Cardinals should bring home their 2nd Title in school history. Getting up early on St. Edward will be key as the Cardinals will not want to play from behind…which they haven’t been since trailing St. Xavier in week 1 of the playoffs when they were down 2-0. With a lead, a steady diet of Ivan Pace Jr. and DSM will keep the defense off the field and fresh for when they have to contain Dzuro and company. This is the Cardinals’ toughest test all year, but as Coach Bolden has been saying since the beginning of the year, “We got all we need!” All gas. No Brakes. GO CARDINALS! Bring that title back to Cincy!